British Ring IBM Convention, 6th-9th September, Southport. From the organisers: The I.B.M. British Ring No.25 82nd Annual Convention 6-9 September 2018 in Southport. There are three exceptional shows during the convention at Southport and full or weekend Registration include tickets to both Aaron Calvert and the International Stars of Magic and Variety Show, please contact the Registration Officer ibmbritishring25reg@gmail.com to register. Additional tickets for these shows and Sooty can be bought at the venue Box Office or call 01704 500036. 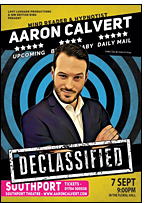 Aaron Calvert: Declassified, Friday 7th September 9pm. What if all the stories you heard were true? Urban legends contained within declassified files are recreated live on stage by master hypnotist Aaron Calvert. Seeing really is believing. www.aaroncalvert.com. 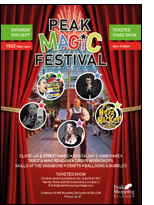 International Stars of Magic & Variety Show, Saturday 8th September 7.30pm. This is magic and variety at its very best, with award-winning international performers who will take you on a journey of comedy, manipulation, juggling, theatre of the mind, grand illusion and so much more. Pickpocket Skills with Professional Opportunist James Brown. Sunday, November 18th, 2018. 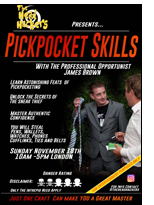 From the organisers: Learn Pickpocketing skills from one of the best in the business, James Brown aka The Professional Opportunist! This is a practical and thorough insiders guide to the art of the steal, for entertainment purposes. You will learn how to steal cufflinks, watches, ties, belts and more. As well as learning a new skill for life, fun and profit, the training will have a positive impact on your own feelings of confidence. Sleight of Hand on the Strand - 50th show! 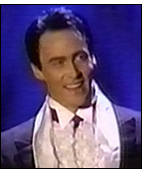 From the promoters: Following the 5 year success of The Magic Hour at Sheraton Grand Park Lane, Tony Middleton (Sonic) reaches his 50th performance of Sleight of Hand on the Strand at the world famous Savoy Hotel, with colleague Dominick Zwolinski. Expect an exciting celebration of the Golden Age of Magic and the razzle dazzle of the 1920s in a truly opulent and exclusive location. Come and join us for cocktails, magic and merriment in this light hearted and heart warming show - a real summer treat! Hand Cut Stripper Decks - the Reviews are in! Potter & Potter Auctions' August 25th Sale to offer remarkable selections of Antique Magicana, including Books, Apparatus, Posters, Archives, and Ephemera. Featuring memorabilia from the Hanlon Brothers and Howard Thurston, two influential turn of last century acts that included dramatic, theatrical, and groundbreaking illusions as part of their performances.